Zeroflame Fire Retardant Treatment is a water based, clear solution that soaks into wood to leave the appearance of the timber virtually unchanged. Applied by brush, roller, spray, dip or vacuum method it achieves Euroclass B (BS Class 0) Fire Propagation and Spread of Flame fire protection on solid timbers. Zeroflame Fire Retardant Treatment can be used inside or out and the fire protection remains effective for the lifetime of the wood surface. Zeroflame Fire Retardant Treatment soaks into the woods surface, without leaving a clear glaze on top like a varnish. It then dries with virtually no evidence of the wood ever been treated, allowing you to keep the woods natural beauty. Zeroflame Treatment does not require over coating however it can be over coated for decoration and/or protection if desired (care should be taken that the fire retardant properties are not compromised). Find out more about other fire retardant paints, varnishes and intumescent coatings from Zeroflame here, all available at Rawlins Paints. Must be applied to bare timber ONLY. Can be applied with a brush, roller, spray, dip or vacuum treatment. A certificate application form is included with every purchase. Can be overcoated with certiain varnishes, stains and paints. Zeroflame Fire Retardant Treatment is a fire retardant system for the fire protection of hardwoods, softwoods and other cellulose based substrates. Zeroflame Fire Retardant Treatment treated timber must only be used above the Damp Proof Course level and/or above ground contact. Trials should be carried out on decorative timber species to check any shade changes prior to the full application of the Treatment. To say that Zeroflame Fire Retardant Treatment is revolutionary is an understatement, this remarkable product will protect timber substrates to British Standard Class 0 certification standard, can be used internally and externally, is not affected by moisture when dry, is non-toxic and non-allergic, the list goes on! Never before has there been such a simple product to use for the protection of timber against fire. The substrate must be clean, dry and free from contamination; existing coats must be removed by stripping or sanding. Each square metre of wood requires 270ml (360ml in the case of Cedar) of Zeroflame Fire Retardant Treament. Application method, site conditions, absorption rate of the timber, etc. will all impact on the number of coats it takes to achieve the require coverage rate. Do not mix with other solutions, stir well before use. Use brush, roller, spray (use appropriate mask when spraying), dip or vacuum method. After treatment of the substrate with Zeroflame Fire Retardant Treatment, the appearance of the timber should be virtually unchanged. Please Note: For both internal and external use it is recommended that a sample of the substrate is coated to establish both absorption properties and possible colour change, particularly when used externally without a protective finishing coat as moisture may create a change in colour. Care must be taken to comply with the coverage rate, including allowance for wastage, as inadequate application will affect the fire protection. Coats should be applied at intervals of 40-60 minutes. Drying time is 24 hours @ 20°C. Fully cured after 7 days. Minimum temperature for application is 5°C. Do not apply to frozen substrate. Maximum fire retarding capabilities acheived after 7 days. Please Note: Drying times are dependent upon the absorption characteristics of the substrate and drying conditons. At low temperatures and/or conditions of relative humidity, drying times will be extended. Where a final decorative finish is required, substrate must be fully dry before over-coating. We advise checking the moisture content of the substrate prior to application and applying the top coat to the manufacturers instructions. A small area of the substrate should be tested for compatibility before the full, final coat if applied. Contact the Technical Department for more information prior to overcoating Zeroflame Fire Retardant Treatment. Fire retardant properties will remain effective for the lifetime of the substrate. NT 053 & NT 054 Accelerated weathering of fire retardant wood for fire testing. Euroclass C (Equivalent to UK Class 1) for plywood. Zeroflame Fire Retardant Treatment achieves Class 1 only, on veneer and plywood laminates, due to the bonding glues resisting penetration. If Class 0 is required on such materials, Zeroflame Fire Retardant Paint or Thermoguard Fire Varnish BS Class 1/0 & EN Class B System is recommended. Discolouration may occur on some types of timber or on heavily knotted wood. If this is a concern it is recommended that a sample area is completed before application to the whole project. Alternatively, application of a compatible varnish or stain may help overcome this phenomenon if it is unacceptable. Zeroflame Fire Retardant Treatment is not suitable for wood-derived particle board or similar as it cannot penetrate. Again, Zeroflame Fire Retardant Paint or Thermoguard Fire Varnish BS Class 1/0 & EN Class B System is recommended instead. Does the certificate you supply with Zeroflame fire retardant treatment meet the requirements of building control. Can I apply the product myself or do I need to have a specialist contractor apply and certify the work? 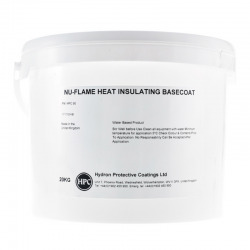 You need to ascertain whether Zeroflame Fire Retardant Treatment meets the requirements of your building control officer for your particualr use. The product achieves BS EN 13823 & BS EN 11925-2 Single Burning Item Euroclass B-s1-d0 (equivalent to UK "Class 0" BS 476 Parts 6/7). A certificate is issued after use by completion of a simple form on the back of the label on the container. Zeroflame Fire Retardant Treatment does not require specialist application. Hello, I wonder if your clear product is suitable to treat OSB in a domestic setting and achieve fire rated status. Zeroflame Fire Retardant Treatment is not suitable for use on OSB. 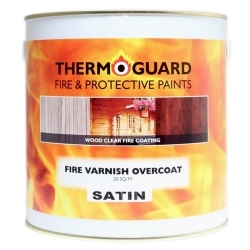 If you require a clear coating and wish to acheive BS Class 1/0 and/or EN Class B then we would recommend Thermoguard Fire Varnish BS Class 1/0 & EN Class B System. I am looking at using Zeroflame to coat exposed ties in a timber truss. Will I be able to paint this with water-based acrylic paint? Thank you. 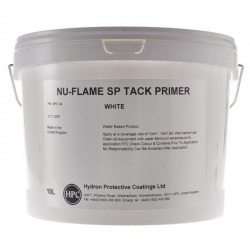 Assuming the areas in question to paint are solid, bare timber, waterborne stains or varnishes can be used over Zeroflame Fire Retardant Treatment as long as they are compatible, non-flammable and will dry. We always recommend to try a small sample area first to ensure the stain does not react with the Zeroflame Fire Retardant Treatment and will dry out. If you are intending to paint a colour then we would instead recommend applying Zinsser B-I-N, followed by Zeroflame Fire Retardant Paint. This will ensure no bleeding through of knots, stains, tannins, etc. from the wood into the final colour coat. Zeroflame Fire Retardant Paint can be either left as a white finish or overcoated. When overcoating use only waterborne latex paints, applied at a total dry film thickness not exceeding 35 microns. I would like to enquire about the suitability of this product( or another recommendation for the following use) Interior Douglas Fir timber, to be finished with lye and soap or lye and oil (some version of linseed or a similar variant). The above treatment is a standard natural treatment for wood and is used extensively in most Scandinavian countries. The lye is a very weak solution (link removed) or similar. The oil specs are as follows (link removed). Ofcourse we would do a trial, just wanted to ascertain any chemical side effects/interactions between the two that you would be aware of Many thanks AVN. 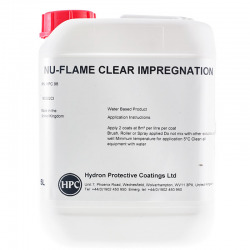 Zeroflame Fire Retardant Treatment would not be suitable but the manufacturers of Hydron Nu-Flame Clear Impregnation have advised they see no issue using the suggested products with theirs, subject to a successful trial as you have recommended. would your product be suitable to fireproof a lintle for a fire place? Assuming the lintel is timber, solid and bare then yes Zeroflame Fire Retardant Treatment could be applied to it. However it is important to note that this will not 'insulate' the timber from heat, the lintel could still reach unsafe temperatures and the proximity of this to your fire should be checked by a professional on site who can confirm suitability. Hello I wanted to know if a wood water proofing treatment such as berettin and sodolin would be suitable to use over this product? Waterborne stains or varnishes can be used over Zeroflame Fire Retardant Treatment as long as they are compatible, non-flammable and will dry. We always recommend to try a small sample area first to ensure the stain does not react with the Zeroflame Fire Retardant Treatment and will dry out. Hello, I am assuming this can be used on a standard external grade treated timber? Zeroflame Fire Retardant Treatment has been tested on multiple timber species, the most popular being; Pine, Spruce, UK Larch, Siberian Larch, Western Red Cedar, Oak and Thermowood. All these woods when the treatment is applied to the bare timber at the specified spreading rate achieved Euroclass B-s1-d0. Zeroflame Fire Retardant Treatment is suitable for use on bare pine and would achieve Euroclass B. The measurements given of your cabin total approximately 57m², but we would assume that you have some areas to deduct from this such as windows, doors, etc. Each 5L will treat 18.5m² and 20L 74m². i am considering using this product for class 0 treatment to T and g softwood cladding on a vaulted barn ceiling , the ceiling is nearly 200m2. To apply 2 coat to both sides of the cladding its going to cost over 5.5k including vat just for the materials!! can i just treat the room side and apply 1 coat ? Zeroflame Fire Retardant Treatment needs to be applied at a rate of 270ml per m² of bare timber (360ml per m² when applying to cedar), whether you achieve this application rate in 1 coat or more doesn't matter, as long as it is achieved. Applying by spray (i.e. knapsack sprayer, HVLP, etc.) usually allows applicators to achieve the required coverage rates in 1 coat, applying by brush/roller would usually take more, i.e. 2-3 coats. Based on 200m² you would require 55 litres (73 litres if cedar), what needs to be protected on your building can only be advised by your authority for the project, so you should refer to them for clarification as to whether both sides need to be treated for example. The Zeroflame Fire Retardant Treatment will protect the beam from burning but not from charring and blackening. Most timber in this situation is tanalised to protect against rot. Tanalising does not generally seal the timber so the Zeroflame Treatment can still penetrate. It is always good practice to drop some water onto the substrate to test how absorbent it is. If water can soak into the timber the Zeroflame Treatment will also be able to penetrate. Is this product suitable for 12mm plywood external plywood cladding? Yes, Zeroflame Fire Retardant Treatment can be applied to plywood but will only achieve Class 1 spread of flame and not Class 0/Euroclass B. Please note, some external plywoods are waterproof and will not allow the Zeroflame Treatment to penetrate. This can be tested by brushing water on the plywood to see whether it will soak in or not. No, on pine the face of the timber needs to be a minimum of 14mm and on spruce a minimum of 18mm to achieve Euroclass B (BS Class 0) Fire Propagation and Spread of Flame fire protection. Assuming the timber in question is bare and natural (i.e. not man made MDF, plywood, OSB, etc.) then Zeroflame Fire Retardant Treatment could be applied to upgrade the surfaces to Euroclass B (BS Class 0) Fire Propagation and Spread of Flame fire protection. However, usually this sort of location would require 30 or 60min protection, if this is the case you would instead need to look at Thermoguard Timbercoat 30 & 60 Minute System. 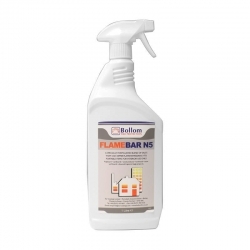 Is this the correct product for fire protecting chestnut cladding on the external wall of my extension? Zeroflame Fire Retardant Treatment achieves Euroclass B (BS Class 0) Fire Propagation and Spread of Flame fire protection on bare, solid timbers. You must ensure this level of fire protection is acceptable to your authority for the requirements of your project before use. If this is not the correct level of protection required by your authority please contact our Technical Department who will be able to provide an alternative product/system for you. The timber should have less than 20% moisture content. We would also recommend you do a drop test with water to see whether it can soak in. As always we would recommend you do a small test area before coating the full project to confirm suitability. Is this suitable for tanalised wood? Yes, tanalising timber doesn't normally seal it so the Zeroflame Fire Retardant Treatment can still soak in. If in doubt, try a drop test with water. We don't know of a problem with maple wood but as long as the maximum density is no more than 780 kg per m3 then it should be fine. A drop test with water will also show whether Zeroflame Treatment can soak in. We recommend you try a small area first to assess if there is any colour change. Zeroflame Fire Retardant Treatment achieves Euroclass B Fire Propagation and Spread of Flame on solid timbers, not 30 minute protection. The products we do have to provide 30 minutes fire resistance to doors (Door Upgrade Kits) cannot be applied to hollow doors. Can you please advise on the wood stains that are compatible with the Zeroflame Fire Retardant Treatment. I am looking for the specific manufacturer and product names that have been tested with Zeroflame. 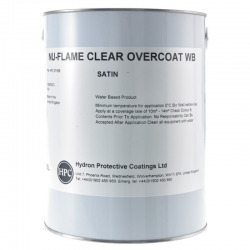 Dedicated topcoats for Zeroflame Fire Retardant Treatment are being looked at but at present the advice is any waterborne stain can be used over Zeroflame Fire Retardant Treatment as long as it is compatible, non-flammable and will dry. We always recommend to try a small sample area first to ensure the stain does not react with Zeroflame Fire Retardant Treatment and will dry out. Can this product be used on a boundary on featheredge cladding? Zeroflame Fire Retardant Treatment can be used on internal or external bare wood. It is regularly used on cladding and achieves Euroclass B (BS Class 0) Fire Propagation and Spread of Flame fire protection on solid timbers. Waterborne paints and varnishes are recommended for overcoating Zeroflame Fire Retardant Treatment. Do you have a copy of the test certificate. We are Firas approved and need to be sure all products have been tested. Yes, a copy has been forwarded to your email address. Zeroflame Fire Retardant Treatment achieves Euroclass B (BS Class 0) Fire Propagation and Spread of Flame fire protection on solid timber. You will need to refer to your authority to ensure this is the level of fire protection they are expecting you to achieve. Due to it being a Surface Spread of Flame rating usually only the sides exposed to fire would need to be treated. Finally, this product would NOT stop or affect the natural weathering process of the wood. We have sent copies of the test data to your email address. Question: Would this be suitable for a fire surround/mantle? The fire Stove sides will be 100-120 mm from the upright beams. So need some kind of retardant to resist heat! 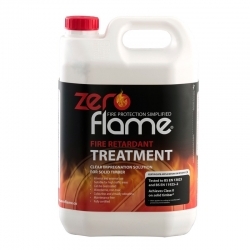 Zeroflame Fire Retardant Treatment would certainly increase fire resistance of the timber surrounding your fire but it can't be used as a substitute for the correct installation and required distances of your fireplace. We have written an extensive article on Painting the Walls around a Fireplace or Multi Fuel Stove which can be found HERE. Zeroflame Fire Retardant Treatment provides surface spread of flame protection but does not provide fire resistance for 20, 30 or 60 minutes protection so would not be suitable. The product that would be suitable is Fire Door Varnish (30min), this upgrades normal timber flat panel, raised and fielded and ledged and braced doors to 30 minute fire resistance. Each pack contains sufficient primer, intumescent varnish and topcoat (available in clear matt, satin or gloss finishes) to upgrade 4 door sides (including architrave and frame). Answer: Zeroflame Fire Retardant Treatment can be applied to pressure treated timber as long as the fluid used was water based. Does Zeroflame Fire Retardant Treatment need to be applied to bare wood in order for it to be effective? Yes it does, it is designed for bare softwood and hardwood and relies on penetrating into the wood. It will only achieve BS Class 1 on veneer and plywood laminates due to the bonding glues hindering penetration. Zeroflame Fire Retardant Treatment also is not suitable for wood-derived particle boards or similar such as MDF and OSB due to it not being absorbent enough. Could Zeroflame Fire Retardant Treatment be used on top of painted, unsealed timber or would the wood need to be sanded back first? Second, could you paint over the top once applied rather than applying stain/varnish? 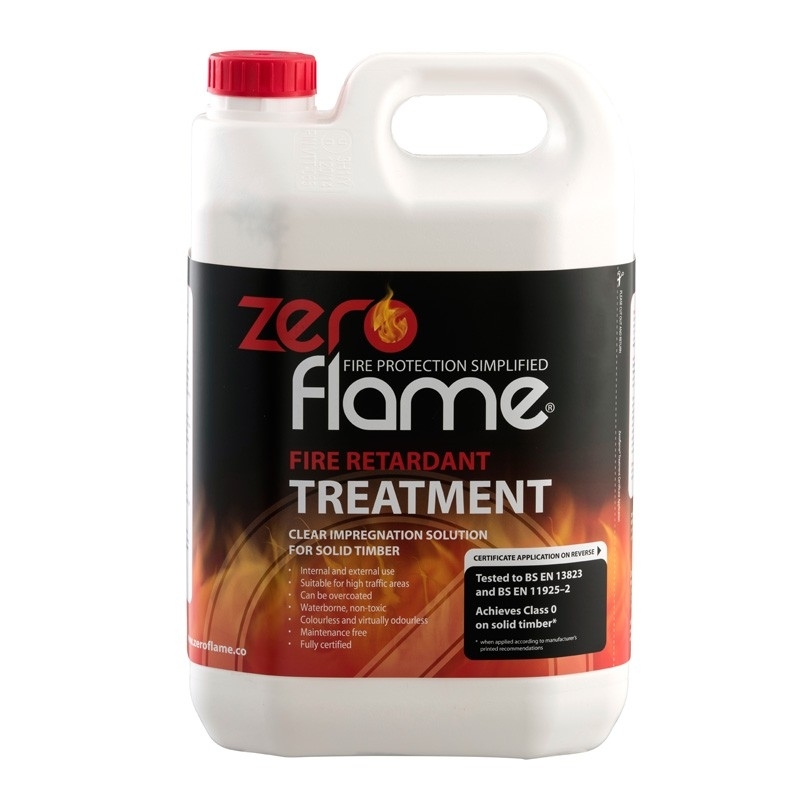 Zeroflame Fire Retardant Treatment is a penetrative fluid that must be applied to porous, bare timber in order for it to soak in to the wood to be effective. It is not suitable for application over any previous coatings, these must be removed by stripping or sanding prior to application. Once Zeroflame Fire Retardant Treatment has been applied and allowed to sufficiently dry (usually around 7 days), you may apply certain stains, varnishes and paints for decoration purposes (contact our Technical Department for details of coatings that are suitable). Is Zeroflame Fire Retardant Treatment suitable for use on Bamboo? This is for use in a hotel. It isn't, but we do have a clear varnish system that is. Please contact our Technical Department on 0113 2455450 for details. Hi, we've just made some large flowers (out of willow withies, lantern tissue and pva) for decor to go inside a marquee at Glastonbury, can you tell us if Zeroflame Fire Retardant Treatment would be suitable to coat them with as a fire retardant? No, the Zeroflame Fire Retardant Treatment would not be suitable but our 1012 Fire Retardant Solution would be.